← Plant-based oils – essential, carrier, infused? As we are approaching the winter equinox and the days grow shorter, we start to feel less active and perky, maybe even apathetic at times. It is the natural body’s reaction to the limited exposure to light during the winter months. This can be however diminished by using mother nature’s remedies – the vibrant flowering plants that are in full bloom during the longest summer days as they bring the much-needed energy of the sunlight to our cells. Think of St John’s wort, yarrow, calendula, chamomile. 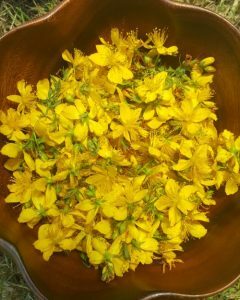 To alleviate the winter’s harshness on the body and soul, try making a skin-loving massage oil or a perfume blend using herbal infused oils of St. John’s wort and calendula enriched with essential oils of chamomile, yarrow or frankincense. This entry was posted in herbal oil, Uncategorized, we love. Bookmark the permalink.